When we clean your chimney and fireplace, we also look for any areas in the system that could represent possible dangers to you and your family. In the Bay Area, we still find many chimneys that were damaged by the Loma Prieta earthquake in 1989. We check the structural integrity of your chimney for any cracks, loose mortar or bricks, or flashing that might leak water. We also check your chimney system from top to bottom for cracked flue tiles, areas that show damage from water penetration or general wear and tear, correct damper function, or any other points that might make your chimney unsafe to use. 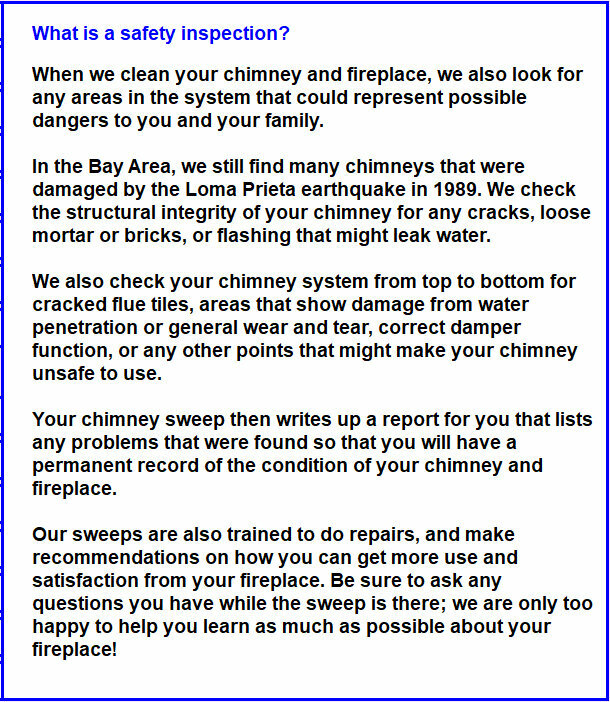 Your chimney sweep then writes up a report for you that lists any problems that were found so that you will have a permanent record of the condition of your chimney and fireplace. Our sweeps are also trained to do repairs, and make recommendations on how you can get more use and satisfaction from your fireplace. Be sure to ask any questions you have while the sweep is there; we are only too happy to help you learn as much as possible about your fireplace!